Taking the phrase “Great Neighbourhood Restaurant” in a fairly narrow sense, I believe Laschet’s Inn on Irving Park Road fits all the qualifications for the bestowal of that status by LTH. Laschet’s, a German restaurant and bar, is clearly a place that draws its regular clientele in part from its immediate neighbourhood around Saint Ben’s but also attracts regular visitors from the broader Chicago community: We’ve become regulars there and live six miles away. With regard to its food, Laschet’s offers a fairly limited but well conceived regular menu, augmented with interesting and delicious daily specials. The quality of ingredients and preparation is unquestionably high, though the prices are not. Compared to its also very fine competitor in that same neighbourhood, Resi’s Bierstube, it certainly takes no backseat, and while both establishments have some particularly well executed items from the kitchen, I believe that as a restaurant Laschet’s offerings, considering the specials as well as the set menu, are more varied and in virtually all instances are very “authentic,” that is, much as one would get at a good, small neighbourhood restaurant in Germany. As a bar, Laschet’s is extremely well stocked with a wide range of excellent German and, to a lesser degree, Belgian beers and the prices are slightly lower than they are across the street at Resi’s, (though Resi’s may well have a broader selection). Great food, excellent beer, good prices, easy parking, open seven days a week; these (and others) are all virtues of Laschet’s Inn. But there is a further aspect of Laschet’s that has contributedly greatly to me, my family and some of my friends becoming regulars or at least frequent visitors, despite not living in the immediate area, namely, the friendliness of the staff and owners. Janine and Barbara are great bartenders who are genuinely friendly, remembering names and preferences of even occasional customers, and Markus, who does most of the table service, is both efficient and affable and takes care of his customers well. Laschet’s is gemütlich, not in any kitschy or silly fake way; true to the real German sense of the word, it’s cozy, laid-back, friendly, in a simple and honest way. 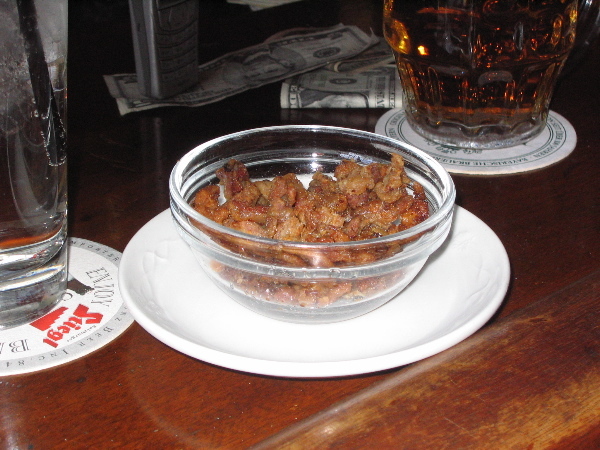 And, did I mention, they sometimes have Grieben as a free bar snack? Last edited by Antonius on June 14th, 2005, 5:53 am, edited 1 time in total. I'll second Laschet's. Great place & well deserving of a GNR plaque. ChiNOLA wrote: I'll second Laschet's. Great place & well deserving of a GNR plaque. Since you beat me to Second, I am pleased to Third Antonious's nomination. I always liked Laschet's, but since Trixie-Pea introduced me to the wonders of their fried chicken and Antionious to their pork gribenis, not to mention Laschet's convivial atmosphere, great beer and Hackepeter, Laschet's is one of my Chicago favorites. Last edited by G Wiv on June 15th, 2005, 6:25 am, edited 1 time in total. I stopped in to Laschett's yesterday about 4 for a late lunch, looking for a bowl of soup on a hot day. They had vegetable beef, chili, and goulash soup, which I chose. It was excellent, very meaty, the soup almost mole-ish in its complexity. Came with nice dense lithuanian rye from Bruno's (I inquired, on Lithuanica the cook told me, which I believe is 63rd Pl?) and butter. A glass of cold water. Definitely a great neighborhood restaurant. A friend of the bartender hanging out tried to engage me in the Michael Jackson verdict. The cook taking a break leaning over the railing separating front and back dining rooms. Two construction workers coming in for landjager with mustard and a beer, followed 20 minutes later by two construction supervisors (apparently from the same site, but distinguishable only by their contractor suppliers free t-shirts). Last, but definitely not least, the soup was definitely not microwaved, but heated gently on a stove until hot and then allowed to cool just enough before it was served to me. Not fast food, as it took about 15 minutes, but well worth the wait. annieb wrote: ...and goulash soup, which I chose. It was excellent, very meaty, the soup almost mole-ish in its complexity. Came with nice dense lithuanian rye from Bruno's (I inquired, on Lithuanica the cook told me, which I believe is 63rd Pl?) and butter. Anyway, yes, I agree, Bruno's makes fine bread. The weird items which Antonius has blocked out of his memory were called something like 'health cookies' -- whole wheat, no salt, no sugar. They are the size of small rolls, come in a bag of a dozen and we really couldn't eat more than a couple. I was thinking they'd be good split and toasted the next morning with jam... but they were not. Oh well. Not every unfamiliar item in a new place turns out to be delicious. Their bread IS very good, though. As I recall, their hours are not particularly convenient: M-F 8-5, or something like that. p.s. Annie, elsewhere you have described the old zoning pattern in Chicago, where taverns would be on the corner of residential streets. This bakery is in the middle of a residential block -- another remnant of that old, very local focus. So where is Lituanica? There used to be a stretch of 63rd Place, I think, short, ending in a kind of cul-de-sac, that had one of those brown honorary street signs and Lithuanian in the name. Is Lituanica just in the L's, before Menard, etc. in the M's and after Kostner, etc. in the K's? There were a couple of nice storefront Lithuanian restaurants there back in the 70's and early 80s, nice dumplings, roast duck, etc. Lithuanians must have a unique conception of health and healthy, witness Healthy Food Lithuanian restaurant in Bridgeport, a fine establishment, but not what my doctor would recommend. For what it's worth, I like hard bread, it's a bit of a bone of contention between Himself and I. If I am making the dressing for the Thanksgiving turkey, I always want to include Baltic Bakery's Latvian rye, and every year it's a bit harder to find. Perhaps we could import some Latvians? Per your P.S. When Bruno's is sold, it will be sold as a name and collection of recipes, if there is a willing buyer. While I am familiar with the zoning laws, I am no expert, but my understanding is that a business selling fresh foods has to maintain strict lines of ownership and licensure to continue in such locations. It is really a sad thing, it has robbed our cities (and even our older suburbs) of much of what used to make them good places to live. My mother used to call the owner of the corner grocery store/soda fountain to give him permission to sell us a pack of her brand of cigarettes. annieb wrote: So where is Lituanica? It's in Bridgeport, parallel to Halsted, just one block west. Elseswhere on the board, I've engaged in various defenses of the term "great neighborhood restaurant." 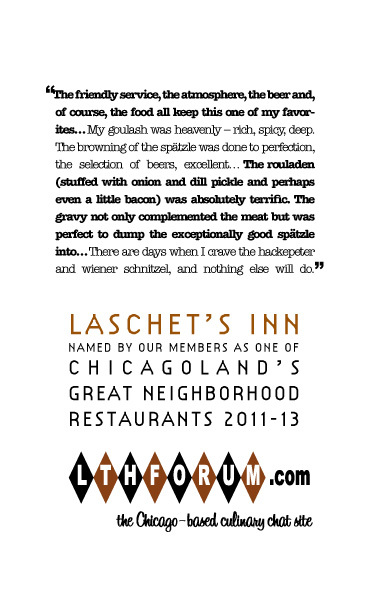 Laschet's tonight has offered me an interepretation I hadn't previously considered: LTHForum as neighborhood. This afternoon, quite late, maybe 3 or 4, I learned from eatchicago that he was planning on dinner at Laschet's tonight. As coincidence would have it, I was planning the same. What more appropriate to a neighborhood restaurant than that two neighborhood fellows ought end up at the same place, unaware of the others' intent? When I arrived, as it turned out, a host of LTHers awaited: Cathy2, G Wiv, and pdaane (actually, the latter a bit after me.) Okay, this meeting in and of itself was not so curious, as impromptu gatherings of LTHForum fellows are not so unusual. But the true confirmation of Laschet's as Great Neighborhood Restaurant came after dinner. At a relatively early hour (9:00?) my dinner companions were preparing to depart, but I was not quite ready. As everyone departed, who should arrive but LTHer psychchef, interested in checking the vaunted place out. So we ordered a round, had an enjoyable conversation, and after psychchef left, I moved down a chair and joined JSM who had also recently showed up. We stayed for another round of beers, a round of shots on the house, and a round of dirty jokes from Franz, whom I presume to be the current owner. Three distinct, very enjoyable, LTH experiences in a span of a few hours. I walked home, so I guess in a physical sense, Laschet's is in my neighborhood. But beyond that, I was quite assured tonight that Laschet's is in my LTH neighborhood. I heartily enorse it as a "Great Neighborhood Restaurant." As an aside, and not an unimportant one, everyone seemed to enjoy their dinners very much. Mine, a frikadellen sandwich; others: wiener schnitzel ala Holstein, chicken paprikash, veal cutlet, and one other I can't recall. That would be my fried chicken. Crisp, delicious, juicy fried chicken, sub spaetzle for fries please. Dinner was up to Laschet's usual standards, in other words, excellent, the food only eclipsed by the company. Ellen and I both had a very nice evening. I was delighted to have what originally started as a plan to eat solo at the bar turn into a mini-LTH party full of good cheer and great food. From the delicious hackepeter to the liver dumpling soup to the best darn schnitzel I've had in town, Laschet's food is first-rate. I also tasted the ultra-crispy fried chicken and the tender and satisfying roast veal. The dinner delivered, across the board. The atmosphere lives up to the food too. This is a true neighborhood joint full of regulars and a friendly bar staff that welcomes everyone. I heartily endorse Laschet's GNR nomination. There is quite a different atmosphere visiting Laschet's on Saturday mid-afternoon as a party of three ladies, than a party of 7 in the evening. Last night I brought my Mother whom I already had promised to take out for dinner before we shifted plans. She and I were lukewarm from our first visit, though our opinion certainly elevated substantially last night. I had the wiener schnitzel last night with red cabbage and fried potatoes. Whenever the next occasion arrises, I will substitute spaetzle for the potatoes. Yes, I agree it was a very nice evening. Where I even learned something about physics, which I hope someone will post about. annieb wrote: My mother used to call the owner of the corner grocery store/soda fountain to give him permission to sell us a pack of her brand of cigarettes. I was at Laschet's on Monday night with la Professoressa and Iatros. We had fried chicken (la P), a hamburger (Iatros, who will eat mayeritsa or kephalakia without pause, could not countenance Hackepeter), and chicken paprikasch. We all agreed that dinner was splendid, our post-prandial conversation lubricated by several Maibocks. I'm pleased that Laschet's is on the list. I wanted to nominate Laschett's but was beaten to it by Antonious, so at this point all I can do is add my vote to make it unanamous. Now that thats settled when do we get together to give Franz and Ursula the good news? JSM wrote: I wanted to nominate Laschett's but was beaten to it by Antonious, so at this point all I can do is add my vote to make it unanamous. John! What do you mean! I waited almost the whole month to nominate! By the way, John, you were the first person to recommend Laschet's to me; vielen dank! Despite new ownership, Laschet's continues to turn out the same top-notch food as always. I think they should be renewed. stevez wrote: Despite new ownership, Laschet's continues to turn out the same top-notch food as always. I think they should be renewed. And not for just the food. It's always been a great spot and remains that way. The German food at Laschet's reminds me of the food my German ex-mother-in-law used to make. Despite that horrible condemnation, I'll vote for renewing their GNR. I support a renewal of the GNR for Laschet's. There are days when I crave the hackepter and weiner schnitzel, and nothing else will do. And I love any restaurant that tops off a gut-busting meal with a shot of fruit liquer. The only bad dish I've had was the leberkase with egg, but not because it was prepared badly. I wanted to stray from the "usual" and didn't know what I was ordering, and it's just not my kind of yummy. Ate there Saturday afternoon before the theatre. The goulash was very good, just a step from perfect. The taste of the paprika was slightly overwhelming and would have been better with about 20 minutes more cooking. The spaetzel noodles and red cabbage were excellent. The food is excellent but some people will be put out by the amount of smoke in the building. My husband and I (along with two friends) ate here last week - and can strongly say that this place is still deserving of a GNR. We've eaten here several times over the last couple of years, and have always enjoyed the experience. Good service, good food, relaxed atmosphere - and the prices are right. To me - that means it fits the bill of a GNR. Plus a great selection of beers - makes for a great night. Of course - I broke this mold by ordering, for the first time, their veal schnitzel - and it was a very good rendition of a classic. (I blame my pregnancy for my out-of the ordinary ordering habits at the moment). But I can also highly recommend the Frikadellen, the rouladen - and their spaetzle. So - to sum up - I fully support the renewal of the GNR. I heartily support the renewal as well. 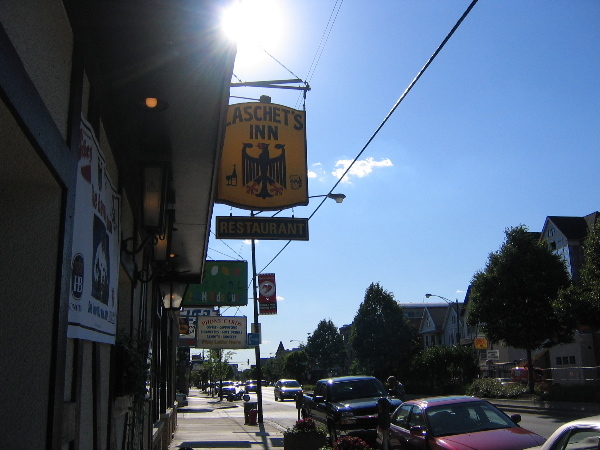 I ate at Laschet's Inn for the first time on Saturday afternoon. My BF and I were driving around the area and were hungry. So I pulled out the GNR pocket guide we keep in the car (I keep one in my purse too - awesome guide - thanks so much for putting it together), found the closest listing and wound up at Laschet's. It was fabulous. Decimated the basket of nice, thick german bread and the cucumber salad. Then split a smoked pork sandwich with melt-in-your-mouth sauerkraut and the veal weiner schnitzel with red cabbage and roasted potatoes dinner. Got two big slabs of schnitzel, nice and tender inside, crispy outside. Excellent. Dessert was strudel, apparently from Dinkel's - I like mine cold, right from the fridge, so the crust was soggy, as expected, but the filling was great, not too sweet with nice chunks of apple. But that sauerkraut - I could eat it by the bucket. Had bacon or minced ham in it - I ate it too fast to figure out which - just delicious! I've been raving about how good the place is since Saturday. Thanks so much for recommending it. Great atmosphere, even on a Saturday afternoon. There was a table of five or six guys sitting in the bar drinking. They'd periodically burst into a rousing German song, singing harmony beautifully. And the more the beer flowed, the more the other guys in the bar joined in. Proost! I support renewal for Laschet's. German restaurants like this are dwindling quickly and an old neighborhood stalwart like Laschet's continues to earn its place on the GNR list. I've sent person after person here, and everyone can't believe how it slipped under their radar. Although fried chicken is a disappointment (and the subject of debate), you can never go wrong with beer and rouladen in Bayernischer atmosphere (sorry if I botched that). Don't forget to partake in the apple schnapps at the end of the meal, either. You get the point. From a bowl of liver dumpling soup at the start of the meal, to licking the final taste of apple schnapps from my lips at the end, Laschetts is a treasure. Laschet's remains one of my favorite restaurants in Chicago. Great atmosphere, excellent beers, tasty hackpeter, herring, spatzel and goulash. Perfect timing, too, as the season turns, for their hearty fare and a mug of real beer. I've been to Laschets twice in the past year, once for the schnitzel, and once for the smoked pork chop. Both were excellent. The place seems to be doing well, which I am happy for. I'd like to see it keep its GNR status. It really is a neighborhood place, and a solid one.